The world’s first fully battery-driven car ferry has been built and begins operation in the spring of 2015. Owned and operated by Norled and built by the Norwegian shipyard Fjellstrand, the zero-emissions ferry is an integral part of Norway’s highway and transportation system, ferrying vehicles across the Sognefjorden, Norway’s largest fjord. Both a major route for north-south transportation and a popular tourist destination, the fjord sees almost one million cars crossing each year. 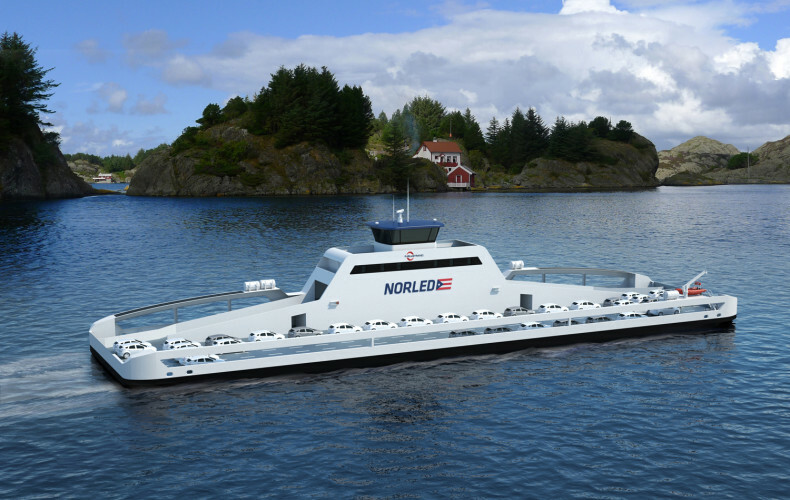 In 2011, Norled partnered with Fjellstrand and Siemens to enter a design competition commissioned by Norway’s Ministry of Transport to encourage a reduction in greenhouse gas emissions within its domestic ferry system. For some years Fjellstrand had been working on the entry’s energy-efficient design platform. Siemens, a company with extensive expertise in power management and electric drive systems, had successfully implemented several lithium battery-powered marine propulsion systems using energy storage systems from Canada’s Corvus Energy. Not only did the collaboration win Norled the contract to operate the electric ferry on the Sognefjorden crossing for 10 years, but its innovative design earned the Norled Ampere – the first vessel produced using Fjellstrand’s ZeroCat design platform – the prestigious title of Ship of the Year 2014 from Norwegian trade journal Skipsrevyen. Passengers, crew and residents of the picturesque villages of Lavik and Oppedal at either end of the crossing will appreciate the ferry’s emissions-free and near-silent operation. Since the ferry is run entirely on battery power, it does not emit greenhouse gases or particulates. The vessel’s batteries are recharged using low-impact hydroelectric power from the existing electric utility grid infrastructure in each village, further minimizing the impact of the ferry service. In contrast, each of the two conventional diesel-powered ferries traveling the route consumes around one million liters of diesel fuel annually – a cost that will not have to be borne by Norled to operate the Ampere. Moreover, each diesel-powered ferry produces around 2,680 tons of carbon dioxide and emits 37 tons of nitrogen oxides annually, at a considerable cost to the environment. Quick charge challenge The 5.6km Sognefjorden crossing takes just 20 minutes at an average speed of 10kts. But the ferries make the crossing 34 times during 17 hours of operation each day, 365 days a year, pausing for only 10 minutes at the quay. The quick turnaround creates an interesting challenge. For optimal energy efficiency, keeping battery weight low is desirable, so it was decided to size the battery with the capacity for only several crossings and recharge throughout the day. However, the villages’ electrical grid could not meet the sudden and high energy demand to recharge the batteries quickly, without cost-prohibitive grid infrastructure improvements being made. “The key concept behind our ferry is the top-up charging of the batteries at both quays while the vessel is loading and unloading,” comments Ivan Fossan, CEO of Norled, in the Skipsrevyen Ship of the Year 2014 issue, referring to the shore power stations that use additional liquid-cooled lithium polymer batteries from Corvus Energy to store energy from the grid and enable battery-to-battery energy transfers. It took the combined expertise of Norled, Fjellstrand, Siemens and Corvus Energy to create the innovative and feasible solution. Built from the ground up, a primary consideration of the ZeroCat platform design was to reduce energy consumption compared with conventional ferries in order to minimize the size of the battery required. By using a slender catamaran style structure made of seawater-resistant aluminum, the ballast-free hulls are lightweight and have minimal resistance, resulting in energy savings of approximately 40% at 10kts. The double-ended ferry maintains its schedule by not turning round. The ferry foregoes side-thrusters in favor of Rolls-Royce azimuth thrusters at each end, only one of which is used for each direction of the crossing. The large-diameter propellers have slim blades and a low rotation rate optimized to reduce energy consumption. To reduce drag, the idle blades are feathered. The system results in a further energy saving of around 7%. Energy-efficient LED lighting and HVAC systems, as well as solar panels, have been incorporated into the ZeroCat platform to reduce energy demand. As a result of the energy-efficient design of the vessel’s hull, propulsion and interior systems, minimum consumption was achieved. Low-load electric drive system The Ampere’s light weight – about half that of the dieselpowered ferries – and reduced drag place less demand on the drive system. Power is provided by two Siemens electric motors with variable speed drive, energized by Corvus Energy lithium-polymer batteries. The motors and other machinery are controlled from the bridge using Siemens power management, alarm and monitoring systems. Corvus Energy Storage Systems (ESSs) incorporating lithium-polymer batteries were selected by Siemens. “We have successfully implemented Corvus Energy battery systems in previous marine applications, including hybrid ferries, so have a good understanding of expected performance and deep confidence in Corvus Energy’s ability to deliver a safe and reliable product,” says Odd Moen, sales director at Siemens Marine and Shipbuilding. Two Corvus ESSs with a combined capacity of 1,040kWh are mounted on the Ampere, one at each end of the ferry, occupying a total of just 20m³ . The Corvus ESS is made up of arrays of AT6500 battery modules, each of which contains 24 lithium-polymer cells. Advanced cell chemistry – Li-NMC layered pouch cells – are the foundation of the Corvus battery’s characteristics that make it ideally suited for the ZeroCat platform. Building on this foundation, Corvus’s marine-rated design and battery management system harness the capabilities of the cell in a safe and controllable manner. The Li-NMC battery module is known for its high power-to-weight ratio. The power density of the Corvus battery is 951W/kg, compared with only 41W/kg for a lead-acid battery or 685W/kg for a typical lithium-ion battery. The energy density of Li-NMC is also high, as depicted above. With the Ampere design calling for 1MWh of energy to be stored on the vessel – enough for several crossings – a high energy density was critical to keeping the overall weight of the battery low, thereby minimizing the required output of the motors. Shore power solutions The Li-NMC batteries also boast a high maximum charge/ discharge rate, which provides rapid top-up charges to the ferry’s onboard batteries. One Corvus ESS is installed on the quay in each village, from which a rapid battery-to-battery charge is performed during the 10-minute docking. These shore stations use Corvus AT6500-LQ liquid-cooled battery modules and store 410kWh each. With active liquid cooling, these units support 2.5 times the continuous current of the vessel-mounted batteries, enabling use of the smallest onshore battery system possible on each shore while safely fulfilling rapid charging design requirements. The shore power stations ensure sufficient onboard stored energy throughout the day. The onboard batteries get fully recharged directly from the grid overnight, when demand is lowest. The shore batteries, on the other hand, are continuously recharged from the village’s grid. Recharging is controlled through Siemens demand-management technology at a rate permitted by the grid infrastructure based on other demands, which vary throughout the day. As with the vessel batteries, the shore batteries fully charge overnight. A low impedance in the Li-NMC battery modules, combined with active cooling of the shore batteries, means the onboard batteries can be charged via a rapid discharge from the shore battery. Corvus AT6500-LQ modules can each support peak discharge/charge currents of 1,500A/450A and true continuous (root mean square, continuous alternating charge and discharge) currents of 225A – much higher than in other lithium-ion batteries. Safety measures The Corvus ESSs have received type approval from DNVGL, American Bureau of Shipping (ABS) and Lloyd’s Register – demonstrating the measures taken by Corvus to ensure the quality and safety of the energy storage system incorporated into the Ampere ferry. The Corvus ESS is built to withstand impact and vibration, and its advanced mechanical design and rack construction provides fire suppression and antipropagation in the event of thermal runaway. All Corvus ESSs are current- and temperaturemonitored by a battery management system that provides warnings, fault, charge and discharge management. 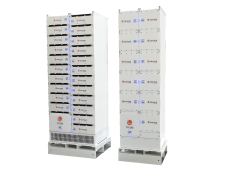 In the Ampere installation, Corvus has incorporated an advanced active liquid cooling system for the shore batteries, which uses a proprietary thermal conductor to remove heat generated during intense use. As an added bonus, modifications to the mooring systems to accommodate recharging the Ampere also enable the diesel ferries to operate more efficiently. “The electric ferry has to be kept completely steady while at the quayside in order to plug it in. To make this possible, we developed a unique automated docking system,” says Norled’s Fossan, explaining that when the ferry is safely moored and stabilized, a laser sensor guides the power connector to a hatch at the side of the ferry, connects the vessel’s battery and begins recharging. This mooring system can also stabilize the diesel ferries, and can therefore decrease fuel consumption. Ferry fleets and beyond Norled’s Ampere project is likely to create a buzz in the marine industry. “Norled will continue the development of electric ferries and encourage the rest of the shipping industry to follow,” Norled’s technical director, Sigvald Breivik, comments in World’s first battery-driven car ferry, published in the Skipsrevyen Ship of the Year 2014 issue. Norway’s ferry fleet is aging, and Fjellstrand counts 40 crossings that could potentially be operated by batterydriven ferries employing designs similar to its ZeroCat platform. It is estimated that in the Norwegian domestic ferry system alone, as much as 400,000 tons of CO2 emissions could be eliminated with the use of batterydriven ferries. In the search for zero-emissions solutions, the lithium-polymer battery could play a starring role.